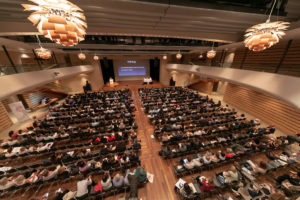 October 2018 (ESR, Vienna) – Athens played host to the European Society of Breast Imaging (EUSOBI) Annual Scientific Meeting, which took place on 11-13 October and saw its highest level of participation since the society was founded. With over 900 in attendance, the congress is on the fast lane to become the universal leading meeting in breast imaging. Held in a different location each year, this year’s meeting saw over 100 additional participants compared to last year’s congress in Berlin. The annual meeting was organised in collaboration with the Hellenic Society of Breast Imaging and involved the active participation of many Greek radiologists, but also pathologists, breast surgeons, medical oncologists and radiation oncologists. These participants, as well as many other worldwide experts helped bring an exciting programme to audiences, with highlights including dedicated sessions on tomosynthesis in screening/diagnostic settings, artificial intelligence and evidence-based imaging, and advanced/multiparametric ultrasound. This year’s EUSOBI Gold Medal, an award introduced in 2014, was given to Professor Christiane K. Kuhl from Aachen/Germany. Part of the meeting’s success can be attributed to its expanded programme. This year, EUSOBI extended the congress to 2.5 days, offering a variety of pre-congress courses. These courses included updates on case-based BI-RADS classification, interventional procedures and B3 lesions. In addition and for the first time, the EUSOBI Young Club Committee organised a post-congress special symposium dedicated to young radiologists with an interest in breast imaging and diagnostics. EUSOBI Past-President, Professor Gábor Forrai from Budapest/Hungary, is delighted with the annual meeting’s growth over the course of his three-year presidency. ‘Each year, I am so happy to see more and more people taking an interest in breast imaging. The fact that they are willing to give their time to come teach, learn and share ideas with colleagues here in Athens is an impressive mark of how dedicated those working in this field are’. During the congress in Athens Doctor Julia Camps Herrero from Valencia/Spain took over the presidency for the next two years. She will be taking office at an exciting time for the society, with EUSOBI having just reached a milestone of serving over 1,000 members for the first time since it was founded. The European Society of Radiology (ESR) would like to congratulate the European Society of Breast Imaging and the Hellenic Society of Breast Imaging for the success of the meeting and look forward to seeing more great things from EUSOBI in the future. You can learn more about EUSOBI’s annual meeting here.